"The folk musician of the year 2018 has a deeper understanding of tradition than most, and at the same time she is boundless in her exploring of the hardanger fiddle. She composes new music in a wide range, and brings out old and sometimes forgotten music that she thinks people today should be offered to hear. She shows us history by exploring the history of the hardanger fiddle and the older relatives of the instrument, and she shows the contemporary through the use of the rich sound register of the hardanger fiddle in new ways. Since her solo debut album in 2006 she has contributed to twenty recordings. In 2018 she has released five albums with as many groups - Slagr, Tokso, Parallax, Sogesong and Aurora Borealis - with music ranging from German middle age music and Norwegian ballads to chamber music and free improvisation. In addition, she has contributed to stage works in Norway and Denmark. 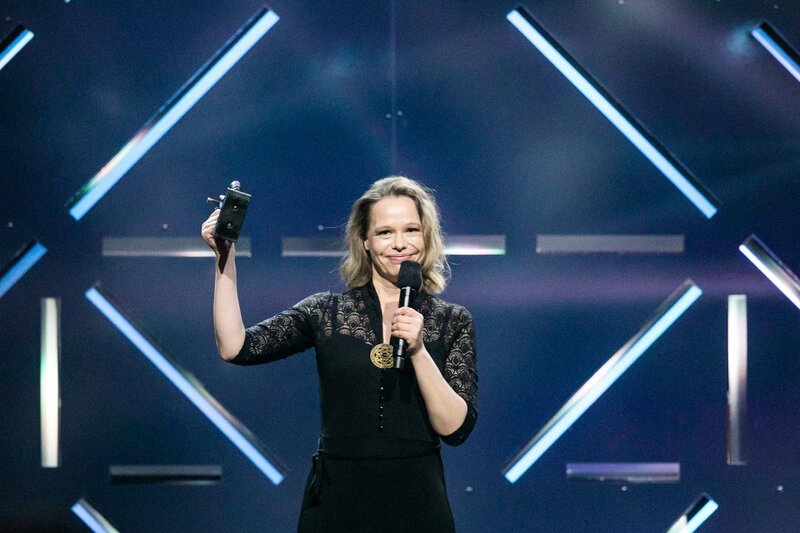 Her album with traditional tunes, Strimur, won in 2017 the Folkelarm awards for solo album and the Norwegian Grammy in the traditional music category. 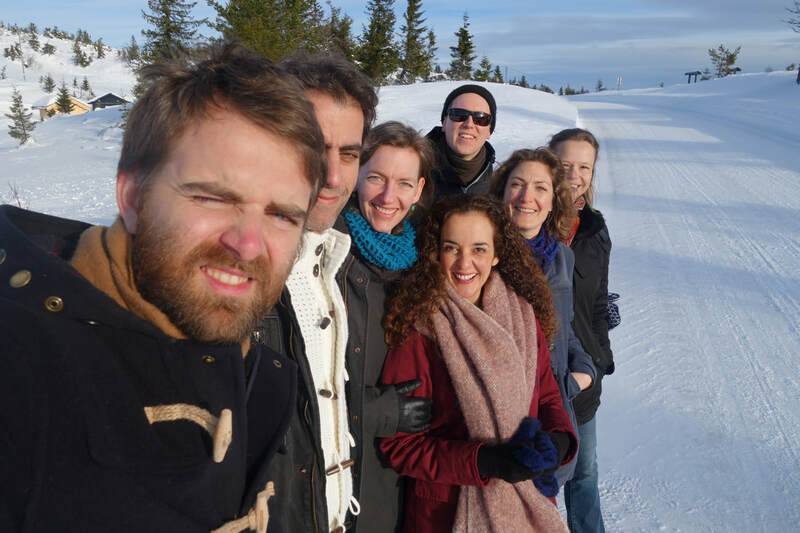 Currently she is writing music to be performed by Telemark Chamber Orchestra and Slagr in Autumn 2019 at Riksscenen in Oslo. As a writer, she is a columnist in Klassekampen. In a refined language, she is presenting and explaining traditional music, musical and cultural political issues to a wide audience. As editor of the journal Årbok for Norwegian folk music, she has been a central force and important voice in the organizational life regarding Norwegian traditional music. 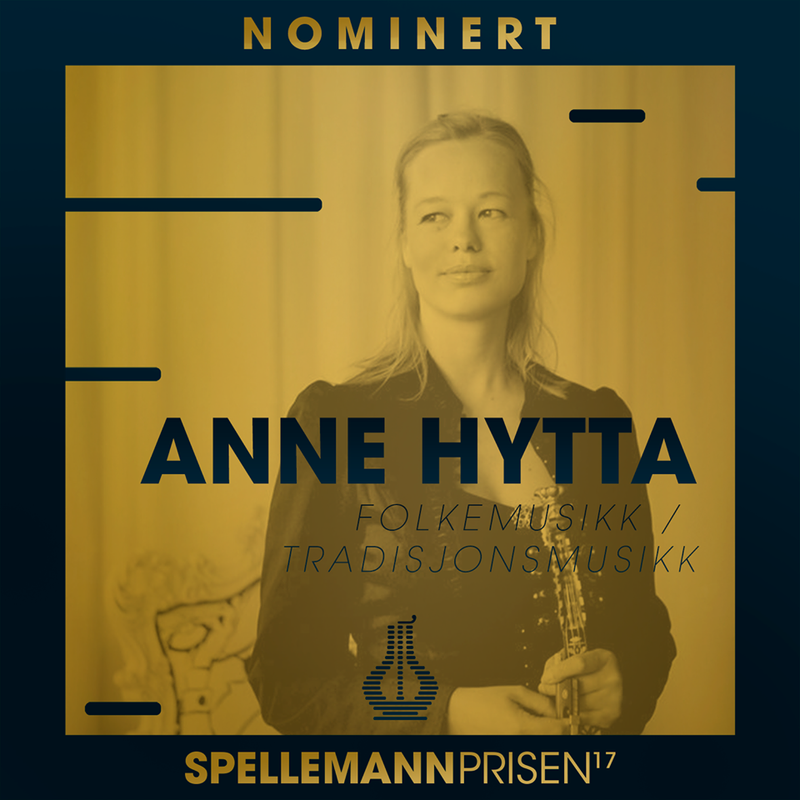 A united jury has approved that the price Folk Musician of the year is awarded Anne Hytta from Sauland in Telemark." Tokso's latest album, Cor Amant, is now available on Spotify. We're really proud of this alum, and glad to share it with you. ​Our next album will be released September this year on Norwegian label Grappa! Sigbjørn Apeland has reviewed three of my latest albums in newspaper Dag og Tid: my solo album "Strimur", my duo album of medieval ballads "Så vide fara dei lindarord" with folk singer and lyre player Øyonn Groven Myhren and the latest Slagr album DIRR, which was released in February on Hubro Music. 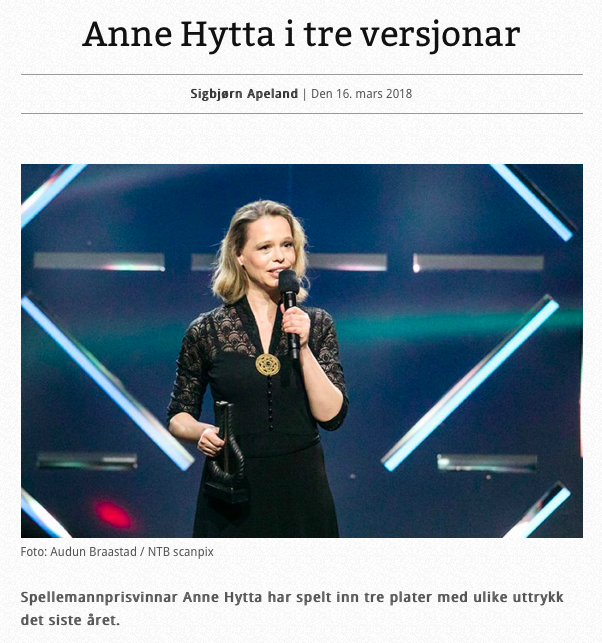 These are truly nice words I take to heart: "This year's winner of the folk music category at Spellemannprisen (The Norwegian Grammy), Anne Hytta, is a musician who stands out by combining strictly traditional music with an open mind to more contemporary expressions. That is precisely what many musicians tries to do, but few does it as thoroughly and complete as Hytta. The last year, she's been involved in three very different productions - on three different record labels. Together these productions how a musician can find her way in different styles - without being split as a musician." 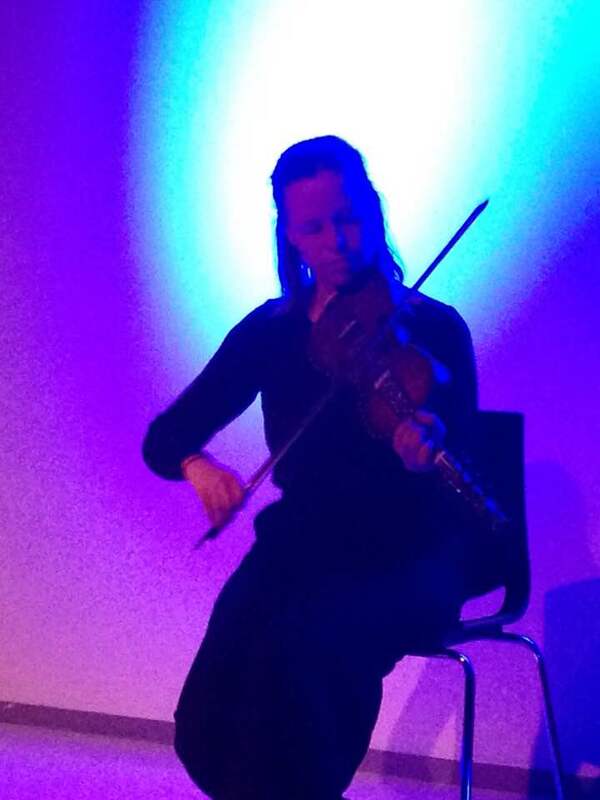 I performed a solo set of traditional and new Draumsyn tunes at the fantastic Spriten Kunsthall in Skien, Telemark, March 1st. After my solo set we had the premiere of Gyrid Nordal Kaldestad commission work "Å sjå deg slik" for voice, guitar, hardanger fiddle and electronics. On guitar: Are Lothe Kolbeinsen. 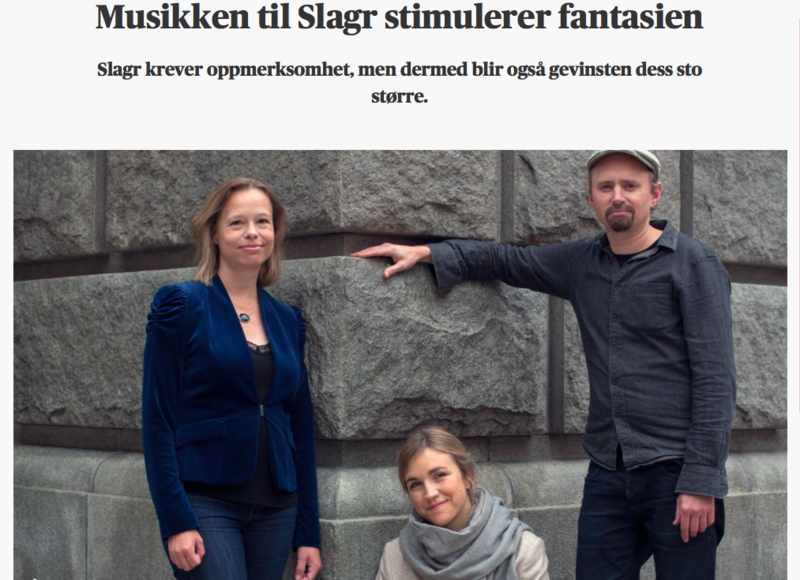 Norway's largest newspaper, Aftenposten, has published a wonderful review of latest ﻿Slagr﻿ album DIRR: "Slagr gives us music of dreams. Their music overwhelms me and captivates me." Click on the photo for the whole review (in Norwegian). My solo album from 2014, Draumsyn, is finally released on Spotify. It contains my own compositions for hardanger fiddle, vielle and viola d'amore, and was released on German label Carpe Diem. Enjoy! I am thrilled that both my albums of last year - my solo album Strimur and the Sogesong album Så vide fara dei lindarord - both are nominated for a Norwegian Grammy for best album in the traditional music category! The Grammy Awards (Spellemannprisen) will take place at Oslo Concert House on February 25th.